Golara Haghtalab was 21 and in her final year of architecture school in Iran when her family decided to move to the United States, ultimately settling in Charlottesville. 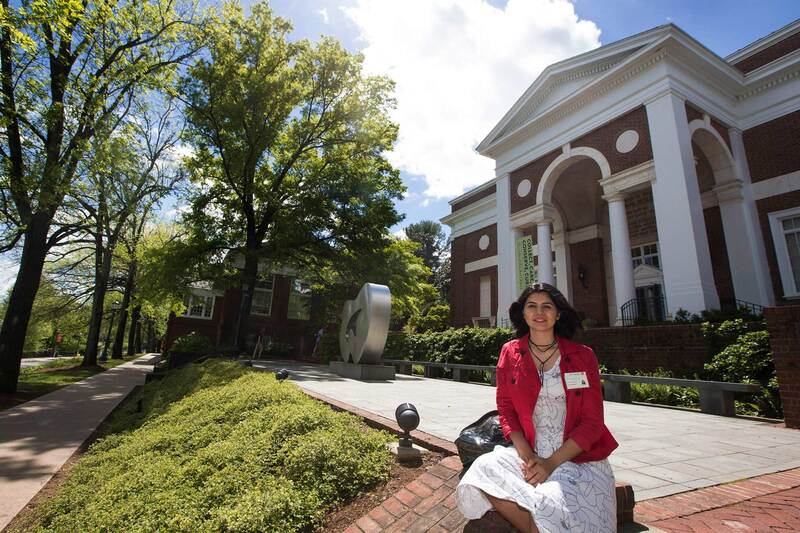 Five years later, the 26-year-old is on the cusp of graduating from the University of Virginia, where she transferred after two years at Piedmont Virginia Community College, re-accumulating the class credits that did not transfer from Iran. 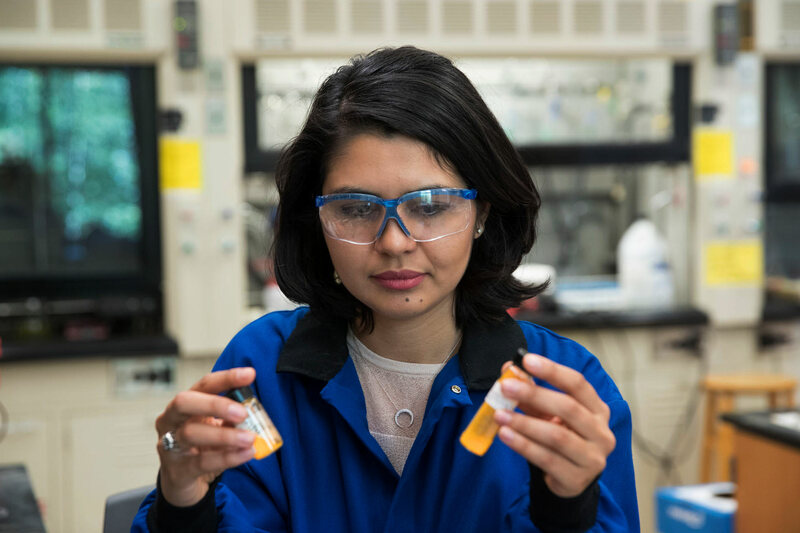 Coming to UVA, Haghtalab decided to major in chemistry, inspired by her mother’s nursing career and her own interest in medicine.“I have always had this combined interest in art and science, which is why I focused on architecture in Iran,” she said.Not wanting to let her interest in art go by the wayside, she also signed up to work at The Fralin Museum of Art. 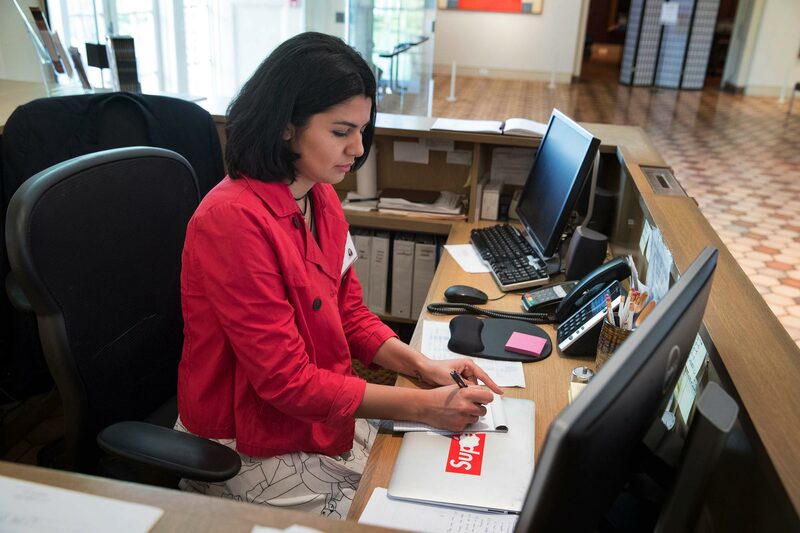 When she transferred at UVA, Haghtalab began working at The Fralin Museum of Art, an institution that she said became a second home for her on Grounds. Haghtalab’s many roles at the museum including working as the head receptionist. 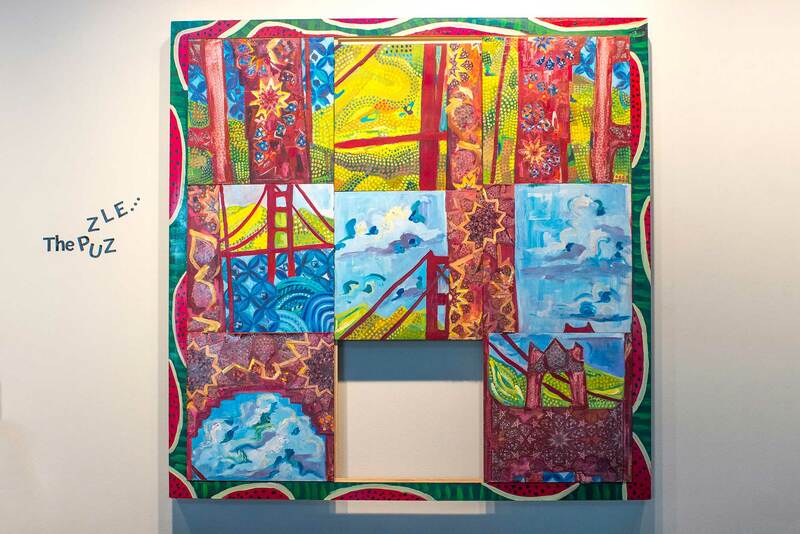 Spending time in the museum’s exhibitions and collections also spurred Haghtalab to pursue her own art.“Here, I saw myself wanting to draw and create more and more. I was craving art,” she said. Haghtalab declared a second major in studio art with a concentration in painting, which required an extra year of classes to finish. Since then, she has shown her art in galleries on Grounds and in Charlottesville, had art published in several local publications and created a painting for the Omid Foundation, raising money to help women in need in Iran. 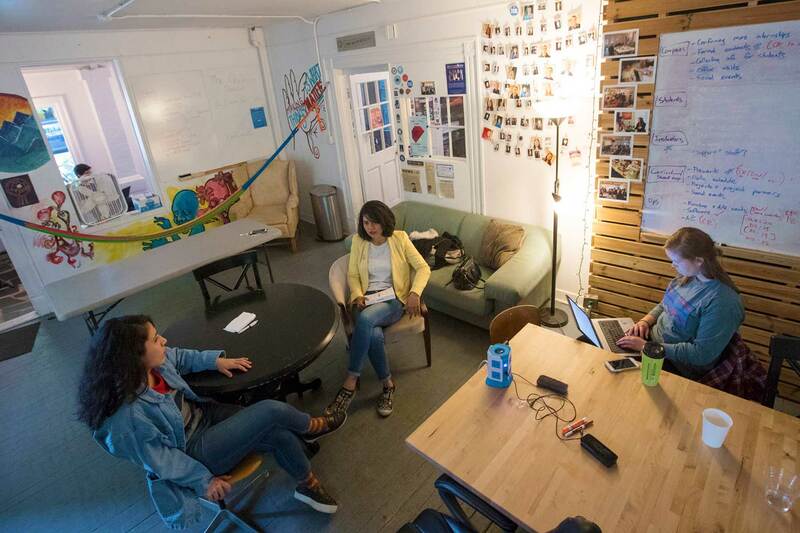 Haghtalab, shown above in HackCville’s headquarters, got involved in the student-led entrepreneurship group last year. 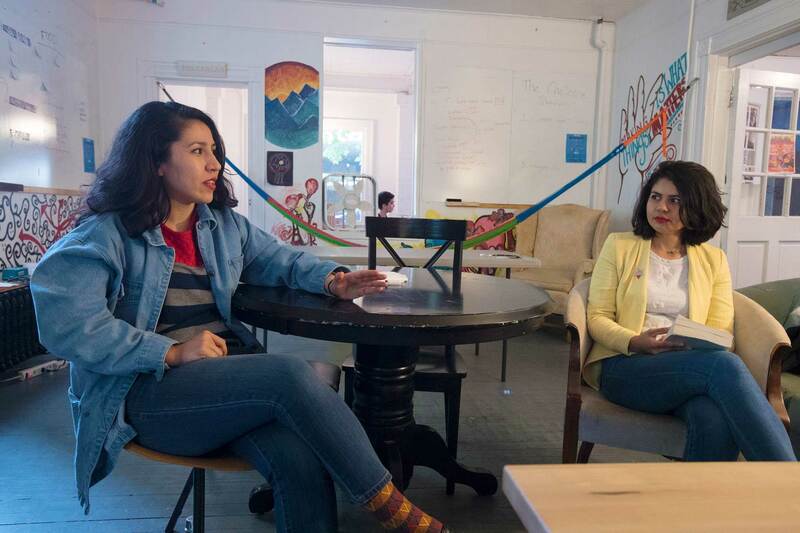 At HackCville, Haghtalab learned that she also loves creating businesses. She got involved with the entrepreneurship hub last summer and now serves as its alumni relations coordinator. Through HackCville, she has taken classes in graphic design and entrepreneurship and helped several student groups working on different startups. She also connected with a mentor, alumna Kaitlyn Houk Witman, who works in marketing in Oakland, California. Haghtalab’s sister, Parisa, shown above, also will graduate this week, from the McIntire School of Commerce. The sisters share an interest in entrepreneurship.“Entrepreneurs are always creating something out of nothing, and it usually starts with great intentions, such as helping others in one way or another,” Haghtalab said. “Working with these people, I am always inspired. I love it.” After graduation, Haghtalab will continue to pursue entrepreneurship. She is currently working remotely as a user experience and user interface designer for Arrived.